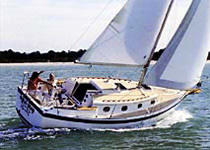 Gulf Island Sails was formed in 2003 as a sailboat dealership to serve the needs of Southwest Florida sailors. Today we exclusively market sailboats from Com-Pac Yachts, and we are also an authorized sales and service center for Tohatsu outboards. Gulf Island Sails is owned by avid sailor Sara Benson, and all of our sales associates are experienced brokers and sailors who are dedicated to bringing to our customers the finest daysailors and cruising sailboats on the market today. We cruise and sail most frequently on the local waters of Southwest Florida, from Bradenton and Sarasota to Fort Myers, Cape Coral and Naples, including Charlotte Harbor and Pine Island Sound. We understand the unique challenges of exploring the Gulf Coast and gunkholing around in secluded anchorages that require shoal draft sailboats. In addition to being knowledgeable sailors, we can provide brokerage services through our partner company, Punta Gorda Yacht Brokers, a full service brokerage providing personal attention to those looking for used powerboats and sailboats. Through Punta Gorda Yacht Brockers, we can arrange financing, appraise your boat and arrange deliveries. Stop in and see us today. We are located in Punta Gorda, just four blocks from the beautiful Peace River and Charlotte Harbor.